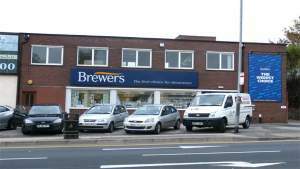 The team at Brewers Decorator Centre Stoke-on-Trent are a friendly, cheerful group that enjoys a good, comfortable relationship with all of our customers. We make service a priority and if you bring a dog with you the chances are you’ll get even more attention. Ours is a bright showroom, where you’ll find wallpaper and paints (including designer paint and specialist coatings), wood treatments and all sorts of decorating tools and accessories. You’ll find us diagonally opposite Aldi and McDonald’s on the A50 Victoria Road, Fenton. There’s customer parking directly outside – although we also delivery locally – and the branch is fully wheelchair-accessible. Head south on Victoria Road, follow this road and the store is located on the left, if you reach the Stanier Street turning then you've gone too far! Head east on City Road, at the roundabout take to first exit onto Victoria Road, the store is located along that road on the right. You'll find us opposite McDonalds and Aldi. Head west of King Street, at the roundabout take the third exit onto Victoria Road, the store is located along that road on the right.